The Bombardier Q400 Range is 1,014 Nautical miles with 74 passengers 225 pounds (lb) each with IFR (Instrument Flight Rules) fuel reserves. The Bombardier Q400 Range converted into the various measurements are 1,014 NM (nautical miles) 1,167 SM (Statue Miles) and 1,878 km (Kilometers). The calculation for the above Bombardier Q400 Range is based on the Bombardier Q400 Nextgen EHGW (Enhanced High Gross Weight) variant of the Bombardier Q400 range. Other "versions" of the Bombardier Q400 (DeHavilland Canada Dash-8-400) have different range capabilities under the same conditions (See below). As always with aircraft, the Bombardier Q400 Range will vary depending on weight of the load being carried and weather / wind conditions when flying the Bombardier Q400. In some of the older brochures that Bombardier Aerospace has created, the Bombardier Q400 Range is listed to be much higher than the one listed above. In the 2006 brochure, the Bombardier Q400 Range with 70 passengers at 220 lb each and Federal Air Regulations FAR 121 reserves the Bombardier Q400 has a range of 1,526 nm (nautical miles), 1,756 sm (statute miles) and 2,826 km (kilometers). This is likely the Bombardier Q400 Maximum range at EHGW. We are currently unsure if the range number in the first (top) paragraph is a mistake in the newer Bombardier Q400 range publication. The Bombardier Q400 Range is made possible by the Q400 engine PW150A and the Bombardier Q400 Propeller - Dowty R408. To learn more about the Bombardier Q400 turboprop visit the other pages on our site about the Bombardier Q400 aircraft. 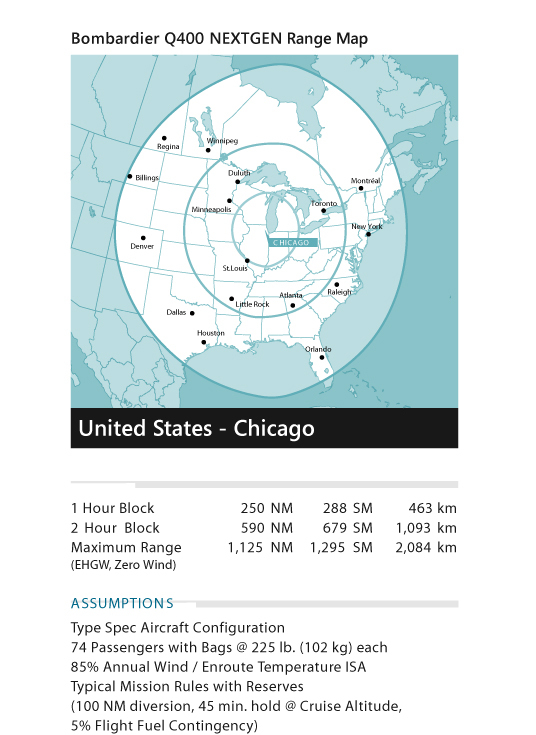 Above Bombardier Q400 Range Map from data from Bombardier.